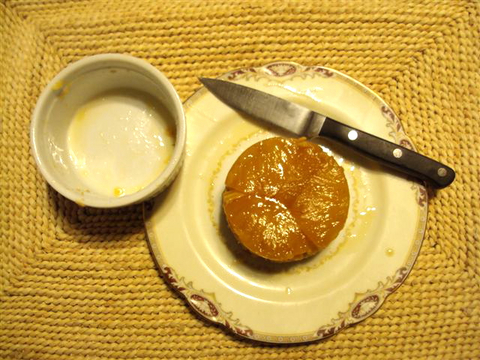 Back in October, Marie Wolf and the Heavenly Bakers were having problems with the caramel topping on the Caramelized Pineapple Pudding Cakes. The caramel was either clinging to the molds upon unmolding or crystallizing in sheets on top of the pineapple. This had us perplexed so it was back to the kitchen for Woody to retest. We found that the stated temperature for the caramel was not high enough, which caused the caramel to perform as the Heavenly Bakers had reported. This resulted in a couple of revisions which we posted on the Book Errata/Corrections on October 25. Marie suggested that it would be helpful to have a few photographs of the process. And Jenn, one of the Heavenly Bakers, came up with a great alternative way of reheating the pudding cakes on the cooktop instead of the oven. Make the Caramel: It is necessary to have the caramel turn a deep amber at 350˚F/175˚C, followed by gently stirring in the butter. Bake the Brioche Puddings: After baking and cooling the pudding cakes, refrigerate them for 6 hours to 12 hours. This will allow the caramel to dissolve slightly and the flavors will intensify. 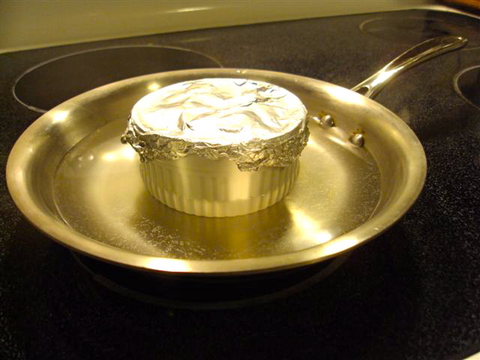 When ready to serve, cover each mold or cup's top tightly with aluminum foil and reheat them in a water bath of simmering water. This can be done in the oven or on the cooktop. 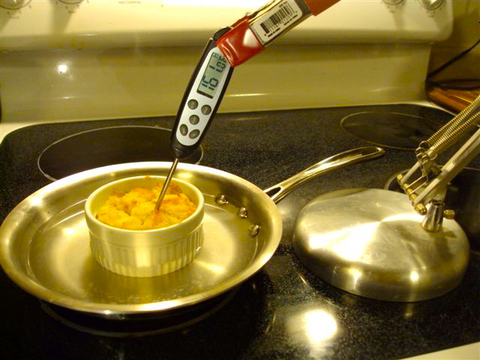 Reheat the pudding cakes until an instant-read thermometer registers 160˚F/70˚C, or a skewer inserted into the center feels hot. Unmold the Brioche Puddings: After inverting them onto serving plates, allow them to sit for 10 minutes before lifting off the molds. Your pineapple pudding cakes should come out looking like our plated cake above, ready to garnish with the reserved juices and crème anglaise. Retesting the pudding cakes gave Woody the opportunity to bake the one recipe on which I had let him off the hook when making all the recipes for the original testing: the wonderful Classic Brioche bread. Snce he had never baked bread before, we let the supermarket furnish the bread. This time he baked the brioche with flying colors, and to Marie's and my approval.--not his first loaf, but that is another story for later this month.